This service began in 1990 when we opened a health care clinic in a village of 29,000 in Southern India. There were no medical facilities that were available to the local people. 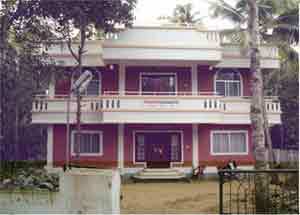 In 1992, Samarpan reached out to those with educational needs by opening an English and Malayalam Library. Between 1991 and 1999 Samarpan sponsored several health camps that provided vision care and general medical health care to over 500 people at each camp. It is a very common and serious problem for the elderly in India when their vision becomes so impaired with cataracts that they are unable to walk or do activities of daily living safely. Samarpan provided a physician who examined over 200 people and found 20 who needed cataract surgery. All of these people were able to receive cataract surgery because Samarpan paid for the surgeries and they have been able to return to an active life. In 1995 we opened a center where people could learn a trade by making sweets and pastries that are eaten for special holiday festivals and family celebrations. Both women and men are being trained and at the completion of their training they are able to begin their own small business. Children who can not afford attend school were given free tuition, meals, uniforms and school supplies. This program had become a real success that none of the students needed any further motivation to attend school regularly.